The Democratic Republic of Congo’s current Ebola outbreak is the nation’s 10th in 40 years. It was officially declared an outbreak on August 1, shortly after the end of a previous outbreak in the country that claimed 33 lives. The disease appears to be spreading in the Beni, Butembo, and Mabalako health zones, according to a recent WHO report on this outbreak. The World Health Organization (WHO) will meet Wednesday (today) to determine whether the worsening Ebola outbreak in the DRC constitutes a public health emergency of international concern. 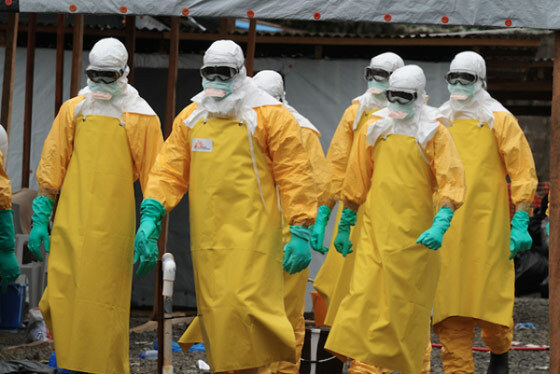 According to Time, the meeting is set to be held at the United Nations’ headquarters in Geneva and comes about a month after the WHO upgraded Ebola’s risk level in the DRC from “high” to “very high,” according to a UN statement. As of now, the global risk was deemed low by WHO and the organization did not recommend limiting travel or trade in and out of the DRC. But depending on the conclusion of Wednesday’s emergency meeting, that designation may soon change. While no cases of the virus have been confirmed outside the DRC, according to the WHO’s most recent case report, one was confirmed near the Ugandan border in late September. The WHO and the Ministry of Health are keeping a close eye on countries that share borders with the DRC, including Uganda, Rwanda, and South Sudan. I know Ebola is nothing to laugh at but I couldn’t pass up sharing this. Saturday mornings were the bomb! Now back to your regularly scheduled programing. . . When will those stupid naggers EVER DIE OFF? I read that Ebola was lab created. Have to have sick people to sell experimental drugs. NaturalNews talks about all of the poison found in supermarket items ingredient lists. The damage has been made an exact cause and effect science. Can we send the libturds to the Congo? The Congo will come to you. TX hospital staff is filmed, hosing possible Ebola barf, into the gutter. Then, the purple irrigation line is used to water public plantings and crops. They post explicit notices, not to drink it. I’d like to buy a vowel Alex! This plague, this out of control cancer will just not stop and you can bet eventually this will come on over to the U.S. and then folks, the party will really kick off big time!! It really doesn’t help when the relatives steal the body of an Ebola victim so that they can bury the body themselves. But is it really the fault of the AID workers if the family doesn’t follow the conditions required? Excuse me, but for the good of the neighborhood, city, country, and continent, maybe the rest of the world, I think the Congo govt should enforce a quarantine and back this effort with armed personnel. If they want to attack and wound aid workers then the world should quarantine the Congo and leave the low IQ morons to their fate. Let nature do its job. Animals, modified for organ donation, may possibly have been recycled into the food chain, as the source of dna contamination; they find horses, too. For purposes of vaccination, Ebola antigens are grown in tobacco plants. In lower life forms, and less-sensitive experiments, deletions, cuts, and pastes are found outside of their intended vectors. The one who says it really doesn’t help when the relatives steal the body of an Ebola victim so that they can bury the body themselves. That screams policy issue, use cremation, or take the body to a deep Hole like 15ft deep, and use lots of Lime.. why is a Body not being secured or disposed of, if it can effect others? Make a Trench and pour kerosene and destroy all contamination. These things you suggest are what needs to happen, but we aren’t exactly dealing with rocket surgeons there.